WASHINGTONA biotech drug from Roche moved one step closer Thursday to becoming the first medicine approved to treat breast cancer before surgery. The Food and Drug Administration's panel of cancer experts voted 13-0, with one abstention, that the benefits of Perjeta as an initial treatment for breast cancer outweigh its risks. The recommendation is not binding, but sets the stage for the FDA to clear the drug as the first pharmaceutical option approved to shrink or eliminate tumors before surgery. A study by Swiss drugmaker Roche Holding AG's Genentech unit showed women who received Perjeta as initial treatment were 18 percent more likely to be cancer-free after 12 weeks than women who received older drug combinations. Perjeta was first approved last summer to treat women with aggressive, late-stage breast cancer that has already spread to other parts of the body. But Genentech is seeking approval to market the drug as the first step in treating the disease. Panel chairman Dr. Mikkael Sekeres called the vote "a historic moment." "We are supporting the movement of a highly active drug for metastatic breast cancer to the first-line setting, with the hope that women with earlier stages of breast cancer will live longer and better," said Sekeres, an associate professor of medicine at the Cleveland Clinic.Documents released by the FDA on Tuesdaysuggested this outcome may be coming, when FDA scientists released a positive review of the drug for early-stage breast cancer. Earlier this week, oncologist Dr. Amy Tiersten of Mt. Sinai Medical Center in New York City, told CBSNews.com the news was "tremendously exciting" for doctors and patients. Doctors hope that using cancer drugs earlier could help shrink tumors, making them easier to remove. In some cases, that could allow women to keep their breasts, rather than having a full mastectomy. Cancer specialists already use several chemotherapy drugs as initial treatments for cancer, but they are not formally approved for the use. The FDA is considering granting Perjeta accelerated approval, a step used to speed up the introduction of drugs that have shown groundbreaking results in early testing. But panelists stressed that Genentech must conduct more trials to prove that Perjeta's early promise ultimately results in longer life expectancy for patients. "I look forward to the day several years from now when we can say that this improves survival," said Dr. Louis Diehl of Duke University Medical Center. "But if it doesn't, I think we should stand up and say we did the very best we could today, but it didn't work out." Genentech, based in South San Francisco, said it is has already enrolled nearly 4,800 patients in a large study to confirm Perjeta's effectiveness. The panel based its vote on a 417-woman study comparing Perjeta in different combinations against older breast cancer treatments. 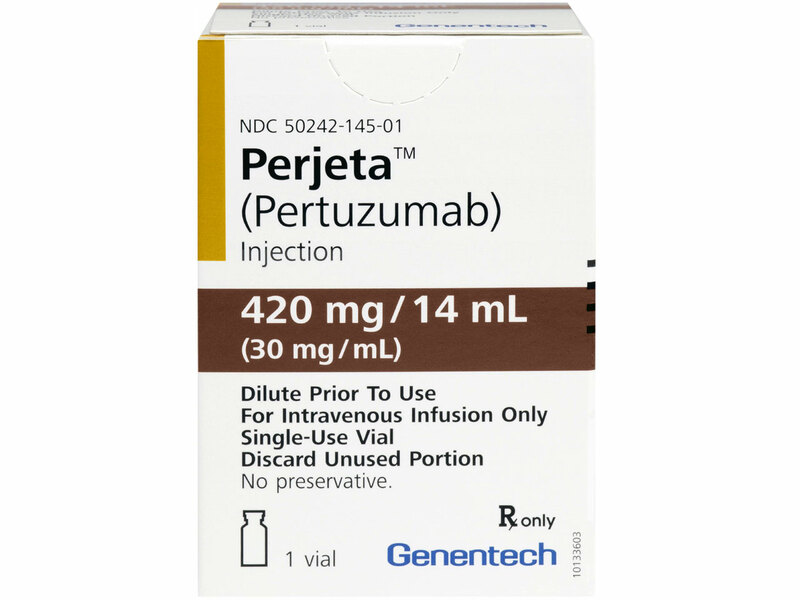 When Perjeta was combined with Herceptin, another Genentech drug, and standard chemotherapy, 39 percent of women saw their cancer reach undetectable levels. Only 21 percent of women experienced the same results from taking Herceptin and chemotherapy alone. After drug treatment, all the women received standard breast surgery to remove any tumors. Genentech says this surgery allowed researchers to confirm the presence or absence of cancer. While panelists ultimately backed the drug's benefits, they pointed to a number of shortcomings with the trial, including its small population size and its experimental measure of effectiveness. Genentech measured patients' initial response to the drug, but it's not yet clear whether those patients will ultimately live longer, healthier lives. The study also showed evidence of worrisome side effects, including a higher rate of heart problems among patients taking Perjeta. FDA leadership acknowledged these issues, but urged the panel to consider the potential advantages of getting the drug to market quickly. "The other side of the equation is you have to look at the benefit, and that is the introduction of an agent that may help many women prevent metastatic disease," said Dr. Richard Pazdur, director of the FDA's office of cancer drugs. The FDA is scheduled to make a decision on the drug by Oct. 31. The panel also heard from breast cancer survivors who emphasized the importance of starting treatment as early as possible. "Reducing the overall time battling the disease has an immense and dramatic effect on the financial, emotional and medical well-being of our lives," said Judy Hodges of Richmond, Va., who was diagnosed with breast cancer in 2006. Hodges spoke as a volunteer for the National Patient Advocate Foundation, a non-profit group founded by cancer patients. Breast cancer is the second deadliest form of cancer in U.S. women, and is expected to kill more than 39,000 Americans this year, according to the National Cancer Institute. More than 232,000 women are expected to be diagnosed with the disease during that time. About 6,000 to 8,000 deaths per year are attributed to the HER-2 form of the disease.